When it comes to multiple sport standouts in the smaller classifications of Kansas, perhaps one of the best in the state may be Troy High School senior Cuttar Huss. Huss, an all-state athlete in football, basketball and baseball for the Trojans, is primed for a huge senior season in every sport that he plays. “As a coach you want your best players to be your hardest workers in practice. He wins every sprint and conditioning drill that we do. He is a dynamic player in everything that he does and has been a major factor in the recent success.” Troy head coach Derek Jasper said. Recent success includes coming up just one point short in the 2-1A state title game a year ago in the school’s first ever title game appearance in football. The Trojans lost 30-29 to Phillipsburg in Hays last November. Troy has been to back to back 2-1A sub-state title games, falling in 2014 sub-state before defeating Olpe 30-21 last season. “The one point loss at state still haunts us all, but then again, it’s been a great motivator for our team for this season.” Huss said. 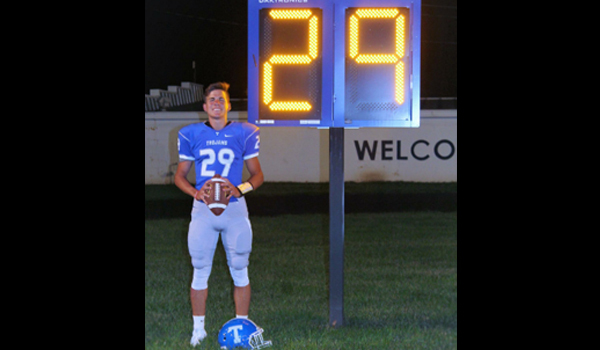 Huss, who plays wide receiver and defensive back in football, has had back-to-back seasons of at least 700 yards receiving for the Trojans, earning All 2-1A honors in each of his sophomore and junior seasons. He also earned first team All-Classes All Non-Senior from Sports in Kansas last season and was the 2-1A Defensive Player of the Year after recording 60 tackles and nine interceptions from his defensive back position. He opened up last Friday night right where he left off in 2015, with 183 yards receiving. Troy, who is ranked number one in the Kpreps.com Poll, returned seven starters on each side of the football off a team that went 10-2 in 2015. Besides Huss, leading that charge is senior QB Reid Greaser, who threw for over 300 yards in week one, after throwing for over 1,800 yards last season. All-State lineman Wil Smith also returns after having a big year in 2015. “Reid Greaser is under the radar. The kid can just play. Will will have another big year on both sides of the football.” Huss said. Right now it’s football season and that’s where Huss’ concentration is and he’s one of those kids that focuses on whatever sport is in season. Huss doesn’t specialize, in face his favorite sport isn’t any of the three he is all-state in, he prefers golf. He averages over 20 points per game in basketball, hits for a .459 average in baseball, and does everything but drive the bus to the away games on Friday night for the Trojan football. Not only does Huss get it done on the field, he’s a role model at Troy. “Cuttar is one of the most humble players I’ve ever coached. He makes friends very easily with not only the students here but all over the county and state. He was voted team captain by his teammates for a reason.” Jasper said. Huss and his teammates look to go 2-0 this week as they face Atchison County (0-1) after knocking off Valley Heights 58-27 in week one. We caught up with Cuttar below. Special Thanks to Rainbow Communications for sponsorship of Northeast Kansas Area Athletics for 2016-2017. Be sure to nominate the Rainbow Communications Athlete of the Month at the end of every month by emailing us at Sports in Kansas, admin@kansas-sports.com. How did you get involved in sports? Right when I started walking, my dad put the ball in my hands and it’s all worked out ever since. What’s it like to play at Troy? It’s amazing. The support we get from the community is unbelievable and the alumni love football just as much as we do. You're a three sport all-state athlete, what is your favorite sport and why? My favorite sport is, surprisingly, golf. I think being out on the course with my friends is just as fun as anything. What was it like to be so close to a state title last season in 2-1A? The one-point loss still haunts us all, but then again, it’s been a great motivator for the team. Who are some of the key playmakers to watch on your team? I think Reid Greaser is under the radar, but the kid can play. Also, Wil Smith should have another successful season on both sides of the ball. What is it like to play for Coach Jasper? Playing for Coach Jasper is awesome! I feel as if he has just as much fun as we do and all he does is coach. He’s been my coach since my 7th grade year, so he knows my tendencies. Expectations for your team this year in football? We think we can make another deep playoff run, but the ultimate goal is a state championship for every team, and we are just like them. Troy is a very small town, explain what it's like to grow up in a small town, what is game day like at the stadium? Growing up in Troy is neat because everyone knows everyone. I think the best part about it is the young kids looking up to you, not just in sports, but simply life. The stadium is rocking on Friday nights and you could rob the town bank without being seen because literally everyone is there. What are your plans at the next level? I haven’t decided what I’m going to do yet. I’m waiting on a few schools, but I may just hang up the cleats and focus on living life. One thing the average person wouldn't know about you? I drink about 6 pops a day. Coca-Cola is my favorite. When not playing sports, what do you do? If I'm not spending time with my family, you can find me watching "Home Alone 2".